I’ll be writing about my new novel Grendel’s Mother, the epic Old English poem Beowulf, the Middle Ages, and the writing process on this blog. Hope you will come to visit it. 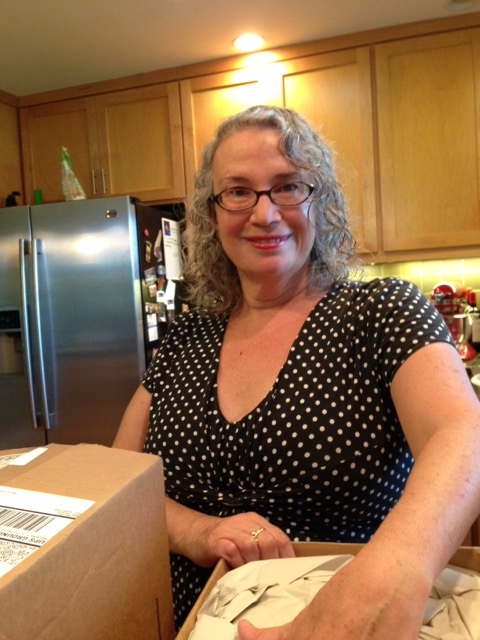 Grendel’s Mother arrives in the mail. There is no more satisfying moment for an author than when the book she has worked on for years finally arrives in the mail as a published volume. Ripping open the top of a box is very satisfying! Here I am holding my first copy. In a once-in-a-lifetime moment: both my newly published books arrived the same day from separate publishers. 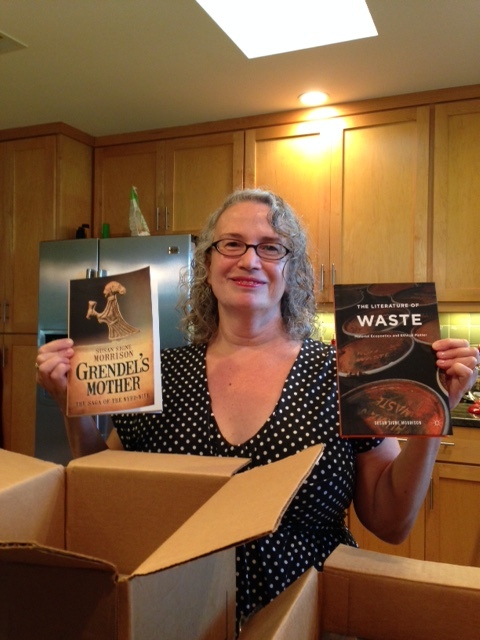 Along with Grendel’s Mother, I was delighted to received my scholarly book, The Literature of Waste: Material Ecopoetics and Ethical Matter (NY: Palgrave Macmillan, 2015). Happy to hold up both! Grendel’s Mother: The Saga of the Wyrd-Wife came into life as a material book over 15 years after I first put pen to paper–and fingers to a very old Macintosh computer barely useable now! One lesson: patience…..
Congratulations, Susie! We’re looking forward to reading about Grendel’s mom! Thanks, Beth! I hope you like her! I loved what I read of it in Hull and am impatient to read the rest. Congratulations! 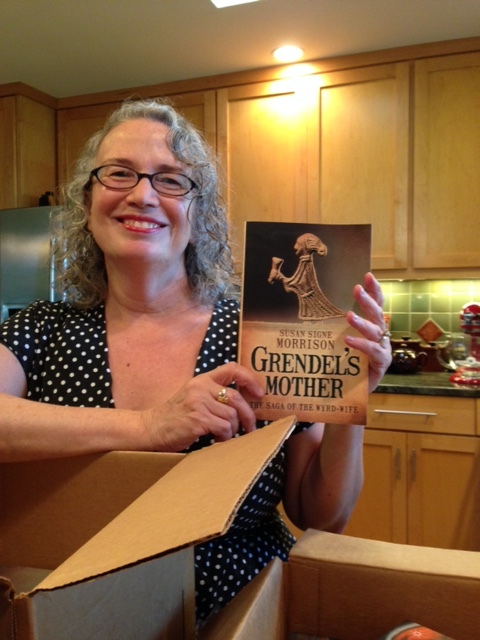 Here’s to the success of Grendel’s Mother and your impending Pulitzer..
Congratulations, Susan! Isn’t it a wonderful feeling? I’m diving back into the book this week–can’t wait to revisit it and think up some juicy questions for your appearance on my blog! I love this book! Congratulations, Susan! 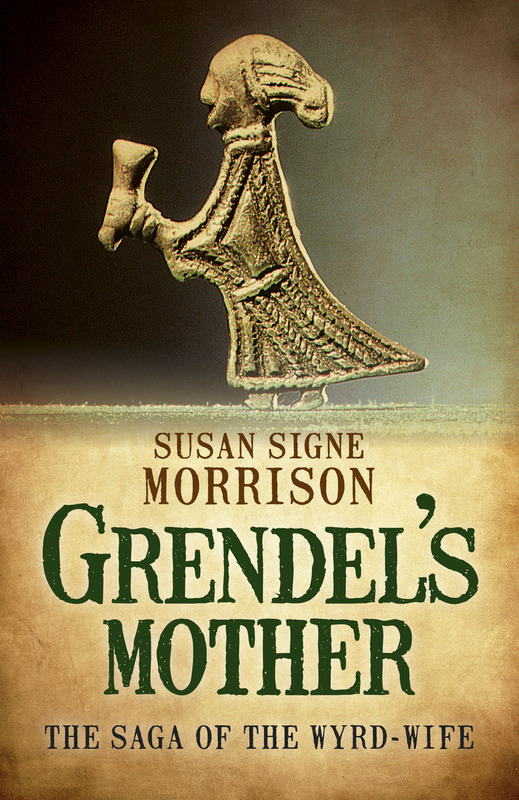 I am diving back into Grendel’s Mother this week–SO looking forward to revisiting it and thinking up juicy questions for your appearance on my blog. I love this book! Thanks, Candace! I’m excited to see what questions you pose. Many thanks and I look forward to participating in your blog!